Leogate Estate is a sustainable estate at the foot of the Brokenback Ranges in Australia’s oldest wine producing region, the Hunter Valley. First planted in the 1970s by ‘one of the founding fathers of the modern Australian wine industry’, Len Evans AO OBE, current custodians Bill and Vicki Widin bought the original 50-hectare Brokenback Vineyard in 2008. 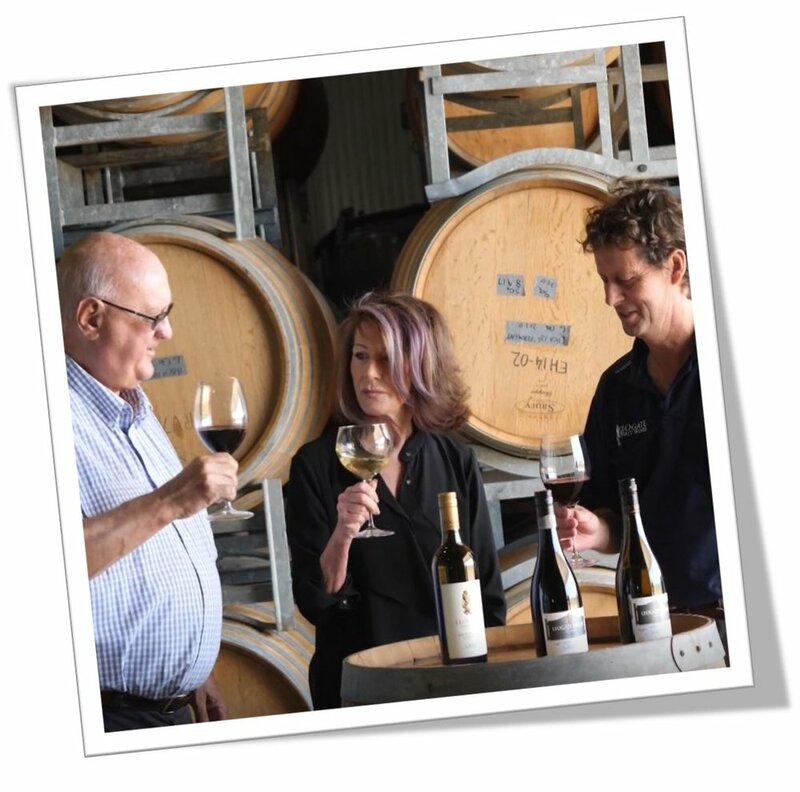 The Widin family has presided over international accolades including the IWC Trophy for Best New Wine, wines poured in Qantas First & Business class over four years, and medals at the Royal Adelaide Wine Show and Hong Kong Wine & Spirits Competition. They have driven significant expansion including establishing a winery, cellar door restaurant and function centre and acquiring a certified organic, high altitude, 25-year-old vineyard in the Central Ranges, NSW. James Halliday’s 2018 Australian Wine Companion gave Leogate Estate a 5-Star Winery rating for the seventh year in a row. Since 2010, the wines have been made by Hunter-born winemaker Mark Woods with an inherent sense for the region’s gorgeous, waxy, lemon-lime acidity of semillon and the graceful, red berry and spice shiraz. Vintage practices promote the purity of the fruit flavours in the wines including handpicking, cold settling and cool ferments. A combination of indigenous and cultured yeast regimes, as well as batch fermentation variation by oak format and oak age, as well as stainless steel vessels, create unique components that build complexity in the final blend. Grown on the original Brokenback Vineyard planted in 1972, the grapes were handpicked and allowed minimal skin contact to retain the purity of the fresh fruit characters. After cold settling, the clear juice was racked, inoculated with selected white wine yeast and fermented at cool temperatures in stainless steel to capture the characteristic Hunter vibrant citrus notes. Pale straw with green-tinged hues, it displays mineral notes of oyster shell, with lemon peel and citrus oil viscosity. An excellent spine of ripe lime acidity and palate length promise classic honeyed notes in maturity; with lemongrass, snow pea, artichoke and mandarin. The Brokenback Vineyard chardonnay was handpicked and cold settled in stainless steel before being divided into five components. The first 10% was racked into new French oak (300 L hogshead barrels) and allowed to undergo wild yeast fermentation. The next three components were racked, respectively, into 1-year-old, 2-year-old and 3-year-old hogsheads barrels and inoculated for a cultured ferment. The last parcel was fermented in stainless steel to bring a fresh character in the final blend. After seven months of maturation, the parcels were blended, fined and filtered. Malolactic fermentation was not encouraged. Pale straw green, this pretty chardonnay displays an oyster shell, silex-minerality with white peach, mandarin blossom and balanced, ruby grapefruit-acidity guiding the integrated, cashew characters of the French oak. From the original Brokenback Vineyard planted in 1972, this shiraz was handpicked and fermented on the grape skin in open-top stainless-steel fermenters. A combination of hand plunging and pump over techniques were applied during the fermentation resulting in vibrant colour extraction with elegant medium bodied fruit flavours. The wine was then pressed off the skin and matured in a combination of new, one, two and three-year-old French oak hogshead barrels for 12-months. Bright crimson; the classic, Hunter-savoury nose follows onto the palate with white pepper, sweet spice and layers of bright, ripe, red berries balanced by quality French oak. A complex flavour profile opens presenting savoury charcuterie, mulberry and damson plums, forest floor hummus and turned earth. From a west-facing, sloping plot on the original Brokenback Vineyard planted in 1972, this shiraz was handpicked, and fermented on skins in open-top stainless-steel fermenters. A combination of hand plunging and pump over techniques was used during the fermentation resulting in a wine that is robust and persuasive but with an elegant, linear tannin shape. The wine was then pressed off the skin and matured for 15-months in new, French one and two-year-old 300 L hogshead barrels. Dark crimson-purple in colour; the nose shows dried bouquet garni herbs and earthy-hummus, with intense raspberry and plum fruits evolving into black cherry kirsch, smoky bacon fat into saddle leather. The wine has a silky and ample texture, flinty minerality, white pepper and star anise spice and long, focused tannins on the complex, well-balanced palate. From Leogate Estate’s Central Ranges, certified organic, high altitude (450-600 metres) vineyards planted along the western slopes of the Great Dividing Range, the merlot was fermented on skins in open top, stainless steel fermenters for 12 days. Gentle juice irrigation over the grape skins during the fermentation period allowed for the extraction of ripe varietal characters while ensuring soft and supple tannins. After the alcoholic fermentation, the wine was matured for 12 months in French oak. Shiny, plum-red hues; this plush, silky merlot is full of Christmas pudding spice and ripe damson plums, ripe raspberries and mulberry, with a gentle spine of high altitude acidity, fine dusty fruit tannins and white pepper spice. In the original Brokenback Vineyard, Leogate Estate uses a range of viticultural practices to preserve fruit characters and protect against regional challenges such as frost, vintage rains and humidity. Vineyard manager, Michael Burgoyne uses wide planted rows, open canopy VSP-trellis, meticulous pruning and leaf plucking; with handpicking, hand-sorting and hand-plunging used at vintage. Vineyard rows are sown with indigenous grasses, artificial inputs are avoided wherever possible, and Leogate Estates promotes traditional natural farming techniques. In the Central Ranges at Gulgong, Leogate uses NASAA-certified organic practices both in the vineyard inputs and winemaking processes during each stage of the vines’ lifecycle. Leogate Estate’s original vineyard is in the heart of Pokolbin in the Lower Hunter Valley, some 170 kilometres north of Sydney. The Brokenback Vineyard is planted to chardonnay (18.1 h), and semillon (3.9 h) on the flat gravelled soils and shiraz (28 h) on the eastern and western-facing slopes of the adjacent rise. A blue, eucalyptus haze hangs over the Brokenback Range with its ridges’ red volcanic soils sloping into the gentle undulations of the valley floor, which sits on gravelly sandy loam over clay and limestone, with fossils from the ancient seabed. Like the classic Mediterranean climate, the Hunter Valley enjoys balmy days in summer (average 30-35 °C) and brisk winters (16-18 °C dipping to 2-4 °C overnight). Its heaviest rainfall is during summer showing a subtropical influence from the north, with a secondary peak in winter (average annual rainfall 750 mm). Mountains on three sides, cloud cover and afternoon easterly sea breezes all moderate hot sun and humidity on the valley floor. In 2016, Leogate acquired a certified organic, 61-hectare vineyard at Gulgong (near Mudgee) planted to shiraz, cabernet sauvignon and merlot. This high-altitude site in the Central Ranges climbs to 600 metres above sea level on the western slopes of the Great Dividing Range. It sits on sandy loam over clay interspersed with shale and quartz, and the cooler climate means its harvest is usually four weeks behind the Hunter. This vineyard produces the Gatecrasher range (available in autumn 2018).